Farrar Straus Giroux, 9780374317768, 111pp. Twelve-year-old Willow would rather blend in than stick out. But she still wants to be seen for who she is. She wants her parents to notice that she is growing up. She wants her best friend to like her better than she likes a certain boy. She wants, more than anything, to mush the dogs out to her grandparents' house, by herself, with Roxy in the lead. But sometimes when it's just you, one mistake can have frightening consequences . . . And when Willow stumbles, it takes a surprising group of friends to help her make things right again. 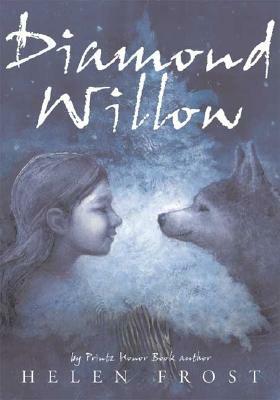 "Diamond Willow" is a 2009 Bank Street - Best Children's Book of the Year. Helen Frost is the author of several books for young people, including "Hidden," "Crossing Stones," "The Braid," and "Keesha's House," selected an Honor Book for the Michael L. Printz Award. Helen Frost was born in Brookings, South Dakota, the fifth of ten children. She recalls the summer her family moved from South Dakota to Oregon, traveling in a big trailer and camping in places like the Badlands and Yellowstone. Her father told the family stories before they went to sleep, and Helen would dream about their travels, her family, and their old house. "That's how I became a writer," she says. "I didn't know it at the time, but all those things were accumulating somewhere inside me." As a child, she loved to travel, think, swim, sing, learn, canoe, write, argue, sew, play the piano, play softball, play with dolls, daydream, read, go fishing, and climb trees. Now, when she sits down to write, her own experiences become the details of her stories. Helen has lived in South Dakota, Oregon, Massachusetts, New York, Vermont, Scotland, Colorado, Alaska, California, and Indiana. She currently lives in Fort Wayne, Indiana, with her family.